Just in case you weren't aware, there is a way to increase the size of the print on your screen. If you hold down the Control key and press the +, every time you press + the screen size will increase. Press Control and - , and the screen size will decrease. I've used that tip a few times, especially late at night when I'm tired and my eyes need the larger type. Quick post tonight. My Craig's List sales started with a bang, but have fizzled out lately. I did sell the dog carrier tonight - the one my dog would NOT sit down in, so that was good. I just finished adding a few new things, and re-posted the rest. Remember the little Smoker/Bar-b-que - the Ancient Type 2 Kamado that I showed a photo of earlier? Well... I was going to sell it at a reduced price to a buyer, but before I did, I again offered it to my son who had originally wanted it. And he did decide to buy it. He said he loves "the art of bar-b-queing" and was looking forward to trying a new type of bar-b-que. He's had it for a week or so, and today I asked him if he had used it yet. He's cooked on it twice, fish and meat, and said it just might be the best meat he's ever cooked. Whew! I would have felt really bad if he didn't like it. But from all the research I did, I thought he'd be happy with it. Off to bed, I have an early morning tomorrow. WELCOME to my new Follower! Thank you for dropping by to read my blog, and I hope you stay to follow along until I FINALLY have an RV - and beyond. I'll try to keep it fun! And I wanted to thank everyone who has left comments. I appreciate all of you, and the great information you're giving me. I have a question I've been wondering about. When a reader leaves me a comment, what is the best way to respond? In my blog? In my comment section? In the commenter's blog comment area? By e-mail? Any of the above? Do you always respond, or only when a response seems fitting? Here's my card - per the suggestion of Ed at Camping World. Can't wait to hand it out. I think this was such a good idea. I wanted to make sure there was an RV on it, since my blog name and URL don't mention RVing. I had to use a generic RV clip art since I don't know what I'm going to end up buying. If you click on the card, you will see the RV more clearly. I LOVE having cards to hand out. When I had my own business, I always made myself cards. I guess I could hand these out to anyone I wanted to keep in touch with, not just RVers. Or to friends who want to follow my blog. Work tomorrow - in our new digs. My company moved over the weekend, the last of our desks and the boxes we packed up at the end were moved for us and put in place. So, tomorrow - a beautiful new office! And it IS beautiful. I went back again to Camping World RV Sales in San Marcos, CA this morning. The first time I visited there, I was lucky to have Ed Graves, one of the sales people, show me what they had available in a small Class C. He has an easy sales style and is really knowledgeable. At that time they didn’t have very many small used RVs on the lot. They had lots of trailers, which I am not looking for, sign of the times, I guess. More people already have trucks and are looking for a trailer to pull with them. Today they had more for me to look at, and Ed said they plan to keep more in their inventory, so I’ll keep checking back, especially as I get closer to being able to purchase. Ed took so much time with me that first visit. He answered all my questions and made a lot of suggestions and comments that were so helpful. He was great, and I’ve been back three times now. I always ask for Ed, although everyone there is very helpful. When she left, Ed told me I should get business cards with an RV in the corner, and my name and blog name and pass them out to people I want to keep in touch with. What a great idea. I’m going to make up my own cards today to have handy. Basket from Camping World. This isn’t us – it’s from their ad online. Remember in a previous blog I said I don’t want a toad, I hope to get a scooter or use my bicycle with a basket for Katie? 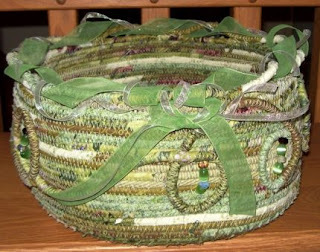 I’ve been researching baskets on line to see what was available. I wasn’t sure it would work with Katie, she HATED the carrier I bought and am now selling on Craig’s List. 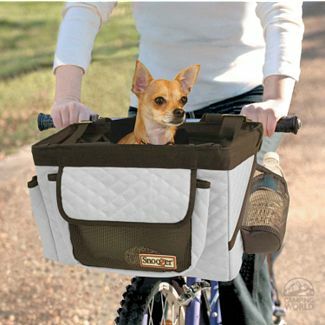 Still not me and Katie – This photo is from the Outward Hound Carrier ad. We never used it because she would NOT sit down and she has long legs, and she didn’t fit very well standing up. It was awkward. Perfect! I have an old cracked orange plastic bowl and a small water bottle that I use for Katie when we are in the car on a hot day. UGLY. This is so small and cute, and it has a string to hang it up. So I got it, too. Together they were under the coupon amount and so I checked out without owing any money. What a great deal for me! When I got home I put the basket together, very easy. I put it on the floor and put Katie in, and she sat down in it!!! She liked it! Then I put the rain cover over her (which I’d probably use at first to make sure she wouldn't try to jump out) and she didn’t mind that, either. She would be tethered in the basket with a clip that is attached, so if she DID try to jump, she'd still stay in the basket. Of course, on the living room floor and on the bike will be very different scenarios, so we’ll see what happens when I try it out on the bike. Might take some practice. Now I’ve got to get my bike out of my storage area, clean it up and see if the tires are okay. I’ll let you know how it goes. So, thank you ED GRAVES and thank you CAMPING WORLD! You are My RV HEROS of the Day! Fulltimers - the luckiest people in the world! Fulltimers: Do you just feel like the luckiest people in the world? I remember when I was younger and living in the San Francisco Bay Area. We would drive to Stockton, Yosemite, Big Basin, or some other place where we traveled through little towns, farm towns, country towns. As we drove by the houses I’d wonder what the people living in them were doing, what their lives were like, what did they DO all day living way out there? I thought they were SO LUCKY to be able to live in such a place. 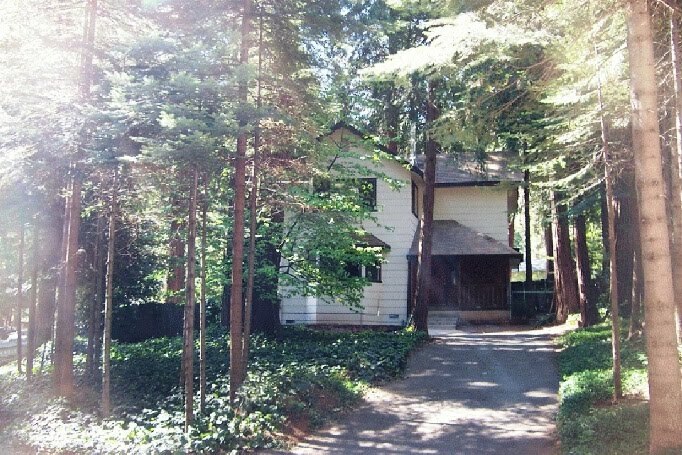 Later when I moved to Placerville, CA and then up Highway 50 to Camino and then finally Pollock Pines, I found out. They do the same things my family did, but it was a smaller community and friendlier because you knew everyone, or knew of them. There was more freedom there, people were allowed to be who they were, even the ones who were a little different, and they were appreciated for their differences. When a group got together, whether it was at a Chamber of Commerce committee meeting, or in a local bar, you knew everyone - and liked everyone - and it was fun. Working and playing together. When I lived there I felt very lucky, and wondered if other people driving by through town ever looked at my house and wondered who lived there. 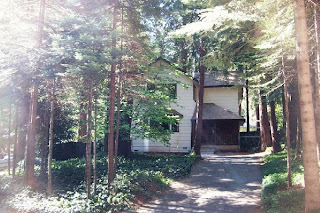 This was my little Pollock Pines house with it’s shingled, covered front porch - right in the middle of my little cedar tree forest. Right on the snow line. I was so excited when I moved there. I’m thinking it’s the same thing with RVers. I see rigs driving by on the freeway, or parked in a lot or on the street, and I wonder what are they DOING in there??? Where have they been, where are they going? They are so LUCKY! I’ll bet you all do some of the same things I do, but you’re in a special, small community, and when you get together at Nick’s Gypsy Gatherings or the Escapees Escapades or other Rallys that I am reading about, you've got a community in common, RV stuff to talk about, places you’ve gone or plan to go, issues with repairs to discuss and help each other with, meals you're sharing. You’re cooking in your kitchens, lounging in your chairs watching TV, sitting at your dinette table with your computers checking e-mail and paying bills. Just like I do now, but I think I’ll like to do those things more in an RV in the desert or in the forest, or in an RV park. So… I wondered about the small town people and their lifestyles, and I finally got to LIVE THERE and BE a small town person myself, and I loved it, it was my favorite place to live. Now I’m wondering about the RV people and their lifestyles, especially the lucky fulltimers and I want to LIVE THERE. And there. And there. I want to be part of that community. And I think I will LOVE it, too. Road trip - RV window shopping tomorrow! 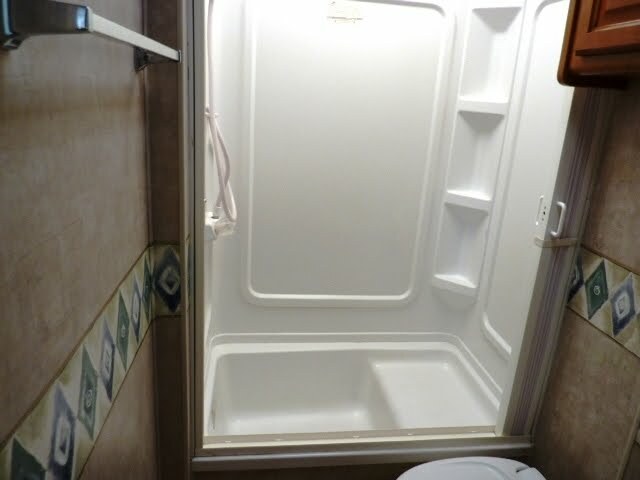 I keep changing my mind about what I want inside my future RV. I don’t think I want carpet on the floors – I’d rather have a smooth floor that I can put rugs on if I need them. I love the rear kitchens, and at first I thought the bed-over-cab only layout was great and of course it would reduce the overall length of the rig. 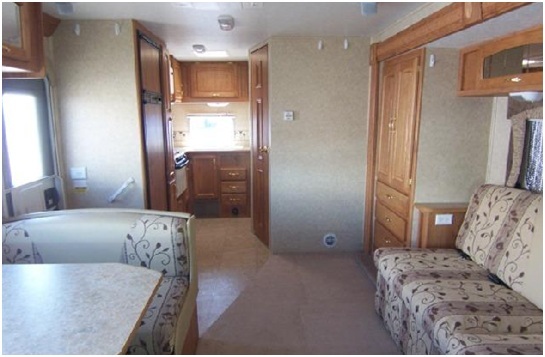 Those RVs are so cute and compact, with good kitchen counter space. I like this one with the rear door - I can see myself cooking with the door open and a nice breeze coming through. I don’t know about the bathroom. I don’t have a sense of where I want it, or if I want it split or a full bath. I would love to have a little bathtub in the shower area. This is a small tub and it might work, and use less water than a larger one. Just the right size for bathing a grandchild after a day at the beach. Actually, I might have to lose ten pounds. I'd have to see it in person, but on second thought I'm not sure I'd fit in it. Lately I’ve been thinking that with a few extra feet in the length, I could have an actual bedroom area, and then I could use the sleeping area above the cab to store boxes or plastic storage containers for hobby stuff, and generally for extra storage. I love my current bedspread and shams, a quilted cotton black and white toile pattern that took months to find, and I plan to use them in my RV. I wouldn’t even mind the bed being RIGHT NEXT TO the kitchen, without a wall separating them, because I love looking at my bed all made up. Maybe I wouldn’t mind it being so visible from the living area. I don’t know. Not sure about the sleeping situation yet. At first I didn't like this layout - with the bed virtually in the kitchen. But done well, it might look really nice. It’s hard when I’m mostly looking at photos of on-line sales. I do live near a CampingWorld, but most of their RVs are trailers or new rigs, and they won’t work for me. It’s been a while since I’ve checked there, maybe I’ll drive over this weekend and see what they have. And check out some other dealers in San Diego County. This blog post took forever to finish. 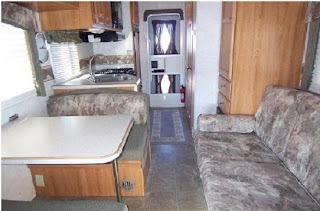 I kept switching to RV websites to check for photos to see again what I’m writing about, and kept getting sidetracked. I did see two rigs that I immediately started figuring out if I could afford them now. Dangerous – but I think I will check some dealers tomorrow anyway. I’ve been taking a break from researching RVs – it’s going to be a while before I can buy one, maybe as long as a year away, maybe early 2011. I miss looking at the used ones for sale on-line and keeping my lists, all the research for fulltiming in general. This evening when I finished reading all your new blogs, I started surfing the used RV sales sites again. What I am planning is a used 24 to 28 foot Class C. That’s probably not going to change. I want something small that’s easy to drive and park, and that gets fairly good mph. I’m hoping to stay in forested areas a lot, and a smaller rig will be easier to find spots for in the trees and will be easier to drive down narrow curved roads. Also, having my house and vehicle in one unit makes me feel I’ll be safer in case I need a quick get-away, so definitely a motor home. I really don’t want to tow a vehicle. That was the second decision I made. I don’t think I’ll change my mind when I start, and I’m hoping I’ll do okay without one. I also plan to find a spot I like and stay a while – two weeks minimum unless I don’t like where I am. If I plan well, and maybe stay two or three weeks, then move on, I can shop, empty the tanks, fill up with water, propane, whatever else I need, and then find another location. There’s only one of me, so I’m assuming I’ll use half the water, and my tanks should last twice as long. I’m hoping good planning will allow me to stay put longer. Does that sound like its possible? be a good alternative to a toad for a single RVer? 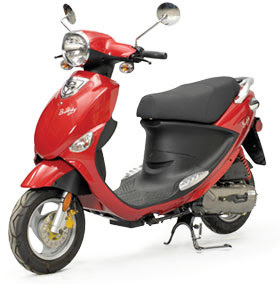 I’ve always wanted a scooter of some sort, and I think that might be a good option for quick trips around the campground or to drive to a close-by town, etc. I remember seeing small dog-friendly baskets that I’ll check out and see if I can get Katie trained to travel in it when I want to take her with me. Or I’ll bring my bicycle. Or get an electric bike. Attach the scooter or bike to the back of the rig. It’s the floor plan that I haven’t decided for sure. I keep thinking I want different things in different places. Tomorrow I’ll tell you what I’m thinking about that. 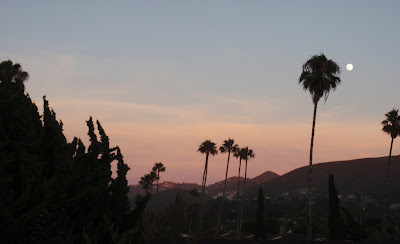 I was going to write about the weather today – it’s been such a weird year so far here in San Diego and across the USA. But it’s cooled down this evening and I got bored with the topic and deleted it. Lucky you! I mentioned yesterday I'd refer you to a great blog that has some really different fonts. At least they were different to me. I like to collect fonts, and over the years I’ve gotten lots of free fonts on the web. But then I found this fun website, Kevin and Amanda.com, that has very cool fonts that you can download to use on your digital scrapbook pages, for card making, or in your word processing docs and I really LOVE them. My header with Katie in her raincoat above is a digital scrapbook page, and the font that I used for Me and My Dog is from this website. The font’s called Pea C-squared. The fonts are what brought me to this site, but she has lots of other interesting stuff, too. When I found Amanda’s blog I spent a lot of time just browsing. If you like this kind of thing, you’ll love her website. Great recipes (lots are scrapbooked like this one for Carrot Cake), decorating ideas, crafty things, really good directions and tutorials, good referrals to other cute sites/blogs and the free fonts (she will make you a font from your own writing – for free). Very cute couple, very cute dogs, very cute blog. The blog has gotten much bigger than it was when I first started visiting, and she now has quite a following. You will see what I mean if you read the posts of her recent travels. This is a link to one of Amanda’s posts - The Beginning of Summer. My Dogs are Possessed. 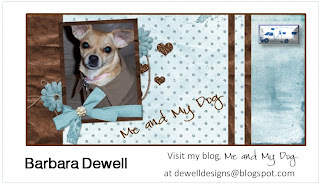 I thought this blog post was soooo funny, the dog photos and her captions. Her dogs have their own blog, too. Miley and Howie are the dogs, and their website is MonsterPaparazzi.com. That's it for now. I'm going to read all your blogs and the spend some time with forums for Wannabes and Newbies and see what's new. Maybe even do a search for a 22' to 28' Class C and see if there's anything new and wonderful on sale right now. Have a wonderful evening, everybody. I know there are a lot of scrapbookers out there. It's something I hadn’t tried yet, but I do create my own greeting cards. Last year I discovered "digital scrapbooking." At this point, I have so many papers and "elements" and “kits” filed away in my computer that I've stopped collecting them. Thousands and thousands of choices, all filed appropriately in easy to find folders. "Blue Papers," "Animals," "Ribbons," etc. You can purchase them on-line and immediately download and use them - and there are TONS of FREE things. Most of what I have is free from lots of different digital scrapbooking sites that I've signed up with. You can use them over and over, re-position things, change your mind, make them bigger, smaller, change the color (in an appropriate program), etc. No mistakes! 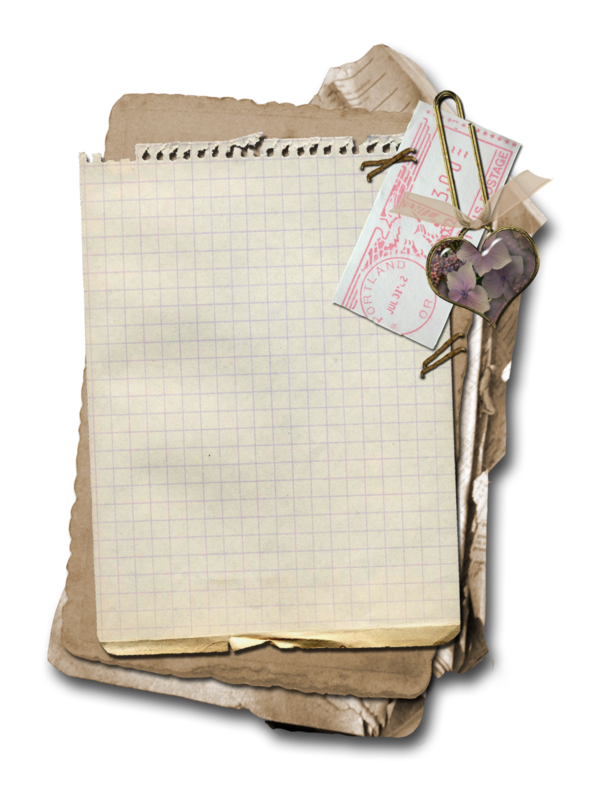 You can make pages that are very simple or very cluttered. I like to make cluttered pages, but I'm slowly learning that "less is more." They don't have the texture of a real scrapbook page, and the colors are only as good as your printer (black and white would look good, too) but WOW - no cutting and pasting, no mess to clean up, no storage problems. I think this is a fantastic idea for RVers as far as an inexpensive and space saving craft. I've sold all my Cricut stuff on Craig's List and plan to pretty much do everything digitally. I can always add a real ribbon, bow, sparkle of some kind if I want to. This is a journaling piece, or tag. If you click on these graphics, you'll see how detailed they are. When you use them, there is no white border around them, they just sit on the page like a real piece that's cut out. You can even download pre-made pages, and just put your photo in it. You may already know about this stuff, but I was blown away by all the cool things I could get for free and have so much fun using. I have purchased kits from time to time, and they are very inexpensive. You can't use them in anything that you sell unless you purchase a commercial license, but they are fine for your own personal use, blogs, etc. It's customary to credit the artist - this is by Connie Prince - called "Reflection." Does it look familiar? See above...my header. This is my Christmas card from last year that I made from a digikit. Sometimes I use Serif Digital Scrapbook Artist and PhotoShop Elements, also. 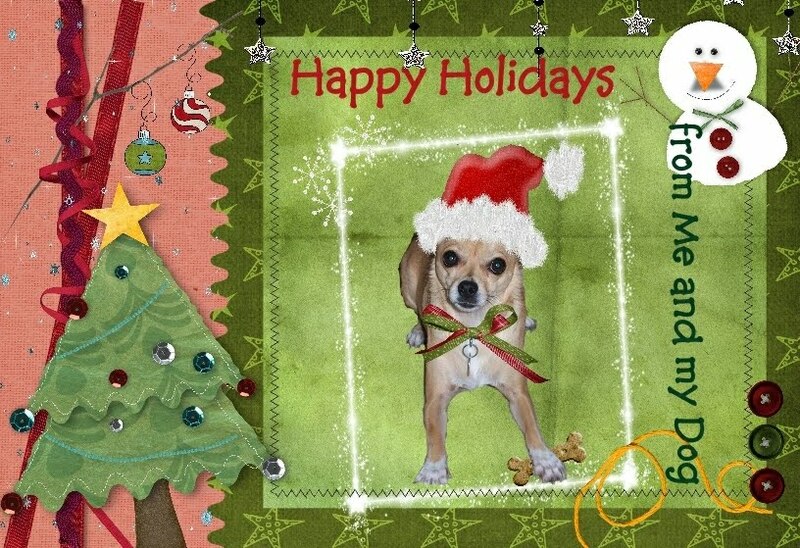 I’m not very good at PhotoShop Elements, but Serif Digital Scrapbook Artist is very easy to use, and there is a free version on this website Daisy Trail. I purchased mine, so I don’t know how the free version works, or if you can get free kits with the free version. They have 21 free “digikits” on the Daisy Trail website that download into the Serif Digital Scrapbook Artist program and also PNG files that can just be downloaded and used like JPGs. I don’t have any connection to these companies – just a recommendation to something I was amazed to find, to make something I love doing - so much easier and better. I hope all these graphics don't bog down your computers. I don't usually have more than one or two photos. And if you're not into crafting, sorry - today and tomorrow will bore you. But maybe you have a friend who might be interested? Check back tomorrow and I'll tell you where I found some fantastic fonts including the one in my header - you're going to love that website! WELCOME to my new Followers - I'm so glad you are following along with me. I'll try to post something interesting each day or so, and hopefully my topics will become more and more RV slanted as time goes on. Well, here I am, Sunday night, reclining on my couch/recliner, eating gorgeous ripe Bing cherries with my dog snuggled up against me. I'm watching 60 Minutes as I type and glancing out my patio slider at the beautiful sunset and full rising moon. It's a beautiful evening, 82 degrees, 6 mph wind, humidity 37. Even though I love storms, this is pretty darn nice! Would you like mushrooms with that? Yesterday I did well with my Craig's List sales, and after a quick trip to the bank, I'm feeling pretty good. Extra on-line payments to credit cards this morning - a few steps closer to my RV. You Go Girl! I don't know why, but I LOVE it when beautiful mushrooms grow in my little grassy/patio area. This is from last December. I love the large family - looks like stadium seating. This lily blooms each year, just one flower, but worth waiting for. And finally, one of my favorite photos. This is my grand- daughter - she's two years old. She was very proud that she put on her own headband (s). At two, how are you supposed to know you only need one? I don't know if my kids would be comfortable having their children's photos in a blog, but I thought this one was safe. WELCOME to all my new followers, and thank you for choosing to read my daily posts. I hope you enjoy them as much as I enjoy yours! When Randy and Pam signed up as followers they were trying to reach 150 followers on their blog, WarneRVnews. I just checked today (it's September 20, 2010), and they now have 154 Followers. Congratulations, Randy and Pam! That's a lot of Followers. WELCOME Pam and Randy, and thanks for following my blog! You have beautiful rig - enjoyed your blog, too. You're one Follower closer to 150! I got my dog, Katie, from a local humane society here in San Diego. She was given up by a military family that had been transferred and couldn't take her with them. She came with dresses, tee-shirts, toys, and a book about Chahuahuas. She was obviously loved and well care for - I was lucky to get a dog that had been treated well and had some training. The best thing is she comes when she's called - sometimes with a bribe of a treat, but she always comes. She's been great dog and a wonderful companion for me. My grandkids all love her and she is good with them. As I said in a previous posting, she is a barker if someone comes near the condo, but that's not always bad since I live alone. She was born 2/20/06 and I adopted her on 5/19/07. That first winter I wanted to get her a raincoat to wear outside during rainy weather (believe me, since this is San Diego, she hasn't worn it much! ), so I went to the local Petco and the only one available that fit her at the time was the trench coat she has on in the photo. The funny thing is, I only have one raincoat, and it looks just like Katie's. Except mine has a hood. Can you imagine walking down the street dressed like your dog? I have had a few comments, but they've been friendly. So, if you're ever out for a walk and see a woman walking her dog, both dressed in trench coats, THAT US! I decided, after seeing all the photos in other peoples' blogs, to carry my camera around with me sometimes. Some of you show georgeous scenery and sunsets and storms, campsites, etc., but there are also a lot of everyday photos of things you all do, and I enjoy seeing those, too. So, today I took my camera to work to show you where I eat lunch every day. I work in San Diego in an industrial park - it's a nice office, but I like to get out of the office for lunch. Sometimes I bring a lunch, other times I grab a burger up the street. I drive around the parking lot to a far corner where I can be alone - there are two parking spaces in the shade facing a hill full of trees and birds. Nobody else parks back there, and I listen to my audio book on my MP3, eat my lunch, and pretend I'm in the forest. I have a timer in my car, and I set it for 45 minutes. When it rings, I drive around the parking lot back to the office. It's a short camping trip, but I get to do it every day! Right now I'm listening to Eat, Pray, Love. The author is the storyteller, and she has a wonderful voice. I tried to read the book and couldn't get through it, and when I saw the audio book, I thought I'd give it another try. The audio book also has some slow spots, but I'm going to finish it this time. I download the books from my local library. They are free, and they have a ton of them. You can download 10 at a time, all you need is a library card. I think all the public libraries have this option. So, in addition to my Kindle which I read, I have lots of books on my MP3. I read all the time, and I can't remember the last time I paid for a book. Back to work today after having Monday off - that was nice. I got a couple of calls during the day from Craig's List postings, but no one has called back. I expected some confirmation calls this afternoon for my address, but that didn't happen. Maybe tomorrow. I'm hooked on a computer game called Fishdom, kind of a dumb, simple game, but I love the graphics and sounds. It's a pretty easy game, but I lose just enough to make it interesting. 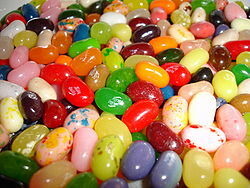 I'm also recently hooked on Jelly Beans. Nothing else going on, so I guess it's back to watching TV and playing Fishdom. I hope it's been a good day for everyone. Don't think I'm cheap for SELLING it to my son instead of GIVING it to him. 2. Get rid of everything. I've already given my kids anything from the past that was of value, everything else will be sold until the end, then it will be a free - for - all or give to AmVets, who will pick up unwanted things. There wasn't much going on today for me. I spent the morning cleaning a Smoker/BBQ for sale, and clearing off a baker's rack that a woman was coming today to see. Also gave a good polishing to an antique platform rocker so it'd look nicer. The barbeque is a Kamado that came with my condo. I hadn't heard of them, but they have an interesting history that goes way back. I did some research to try to price it, and had a heck of a time finding one like mine, so I guessed. In fact, I couldn't find one similar anywhere on the web. There are new ones for sale, big ones mostly that look like pieces of art, covered in tile. But I couldn't find a single used one anywhere. There's a small cookbook from 1976 that was inside my Kamado, and it has information and recipes. It shows the three sizes of the "New Models" and the five sizes of the "Ancient Type." Mine is an Ancient Type #2. Here's a photo - anyone out there know anything about these? If so, can you put a value on it? It weighs 80 pounds so it's sure not coming with me! I was very excited to receive two e-mails from people wanting this. Unfortunately they wanted to pay with Cashier's Checks. What's with these people? Their scam must work often enough for them to keep at it. I'm loving the weather in San Diego this summer. I've been here for six summers now, and usually I get pretty bored with the constant pleasant weather. I love rain and wind and storms, and like it when the seasons bring different types of weather. We don't get enough "weather" here. But this year is so strange, lots of rain, even a bunch of thunderstorms. Here it is the middle of August and I've turned my air conditioner on once - for a couple of hours. We've had the usual "Grey May" and "June Gloom," and now this year "Bummer Summer." Or so they are calling it. I love it. Overcast mornings, very pleasant days, and cool, cloudy evenings. Yesterday I said I'd show you another craft item I've been making. 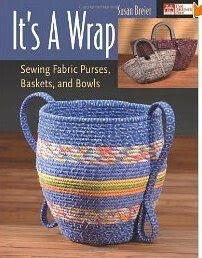 It's a basket, and you need a sewing machine (I guess you could do this by hand, but I wouldn't want to). The materials needed are fabric strips, glue stick and clothes line. You have to get the right kind of clothesline, though, or it won't work. 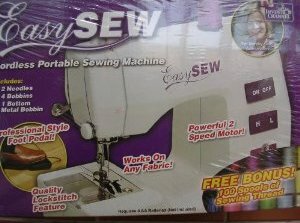 A sewing machine needle has to go easily through it. Check out this link How to Sew a Fabric Bowl, this is a photo of a bowl from this website. Isn't it beautiful? I've made this one with the handles that is shown in the book. Mine was all one color, though. You'll be surprised how easy these are. 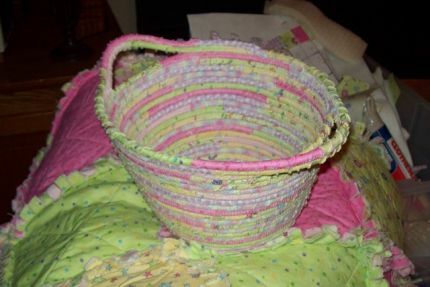 You can make them all one color, or with different layers of colors, and the funny thing is, even though you do the same thing with the same fabric wrapped cord, when you are done sewing the basket, each one is different. I bought this book, It's A Wrap, and followed the directions and suggestions, they seemed the easiest and worked best for me. I got it on amazon.com. Well, I'm not intending this blog to be about crafting - but I like to pass on things I've learned and enjoyed, and I'm hoping I can continue to do this kind of thing when I'm fulltiming. Question: Is full timing - fulltiming one word or two? Friday - I worked today for a co-worker who needed to take the day off, so I will get Monday off. That will be nice for a change. I have a lot of organizing to do for my sales "stuff" - a women is coming tomorrow morning to buy an air mattress. I think I will set everything up with little price tags - I might be able to cross-sell. http://www.makeit-loveit.com is the website. She has tutorials that show exactly how she makes the items, this one is just styrofoam balls, hemp, hot glue gun. 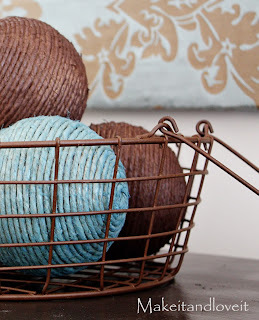 Wrap the hemp with hot glue to hold around the ball (she shows how to hide the ends), take them outside and spray any color from a paint spray can. Couldn't be easier! Arrange in a wire basket. I'll show you tomorrow another REALLY nice gift I've been making - people have actually asked me to make one for them, too. It's really easy also, and very inexpensive! I have an office/craft room full of machines, gadgets, all the stuff needed to make about any craft item. 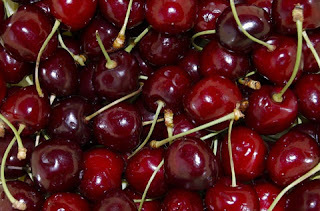 I'm planning to keep some to bring with me, and this one tonight and the one I'll show you tomorrow are perfect things to make in a small area, inexpensive, easy, very nice, and the materials are lightweight and easy to store in an RV. These are the kinds of things I'm looking for in crafts to do when I'm on the road. I figure making things will keep me busy, supply me with gifts when needed, and could even be a money maker if I wanted to spend enough time on them. 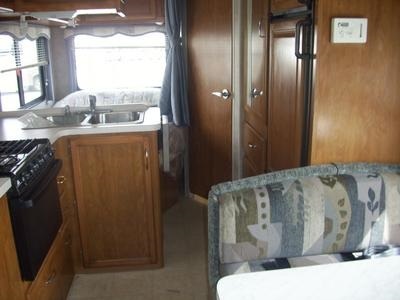 I'm selling anything that's too big or needs too much room, or isn't practical for RV living. I'd guess there are a lot of creative people out there RVing - especially the full timers. Like Linda's jewelry and Janna's quilting, and so many photographers. Anyone else? The old Cashier's Check scam - and my first sale! This was an interesting day. I was so excited about the responses I've had so far from my listings on Craig's List, especially since the first one was for my dining room set. He asked if it was still for sale, and I replied that it was. He answered by saying he would pay me more money to take the ad down, wait for his Cashier's Check, and as soon as I deposited it, let him know and he will send his "shippers" to my house to pack it up and send it off to him. I wouldn't have to do a thing, they would do all the packing/shipping. Would I please send him my name, address and phone number, and he would send the Cashier's Check today. Of course, that was the first e-mail I opened since it was the highest priced item, by far. As I read through his second e-mail, my excitement faded fast. I responded that I would only accept cash, and never heard from him again. I've heard of these scams, but never expected to be a target. Thank goodness I'd heard about this, so I didn't fall for it. Then a lady who responded to another ad came by and bought a small sewing machine, an Easy Sew. My first sale... hopefully the first of many. I bought this a while ago and never used it, isn't it cute? It's really small - I hope it works for her. Welcome to Wild Blue Yonder, my FIRST FOLLOWER! And thanks for your comments. I really identified with the words in your profile. And thanks to RB as well, it is nice to know someone out there is stopping by. I think that's one of the many things that draws me to this lifestyle. I'm sure I am very different from some of the people whose blogs I am following. But there's something that I connected with in each one. Men, women, younger, older, single RVers, couples and families, dog and cat lovers, and turtle people. At first I was searching only for full timers who were single women, preferably older like me, but as I clicked on their lists and read some of the blogs they followed, I found these other people very interesting and wanted to follow them, too. I hope that by the time I'm on the road, or at least have my RV and am able to take some short trips, I'll meet some of you and some of them "around the campfire," as Wild Blue Yonder said. Oh, I can't wait!! You full timers remember that feeling, right? Finished some listings for sale - This is fun! Short blog tonight - this listing business is easier and more fun than I thought it would be. Kind of addictive. Once I started I didn't want to stop. Between each listing I'm checking other sales on Craig's List or just doing a Google search to get an idea of the item's value. It's time consuming, but surprisingly not at all like a chore. I got eight things listed, but now that I know what I'm doing, it should go faster from now on. I have the last item listed for tonight. Poor Katie - she's sure not getting much attention this week. Today was a long day. When I got home from work I warmed leftovers for a quick dinner and then started arranging things on my dining room table to get photos for Craig’s List. I just sat down to transfer them to my computer and get started when my Dad called. He and my mom are 89 this year, and are going through some age-related difficulties, and they are making a move in a week or so. It is going to be hard on them, and I’m too far away to help right now, but my sister and brother are retired and close by, so they will be there for them. If I was traveling in my RV, I could head west and visit and help. Maybe next time. My Dad was worried that they can’t take their dog, a three-year old Chihuahua smaller than my Katie and a really cute dog with a great personality. I knew my daughter and her family loved the dog, and have been looking for a small dog, so I called her and she said they’d love to take her. I called my Dad back and he was really relieved. My kids will LOVE that dog. When I finish this, I’ll get back to the listings – I guess I need to do some research on the web to find out what I should list the items for. Some of them are large, like my dining room table and chairs – round table with a glass top and four chairs – and a decorative mannequin. I hate to sell the mannequin, I put an old feathered hat on it from a costume I have and she looks very fancy in my bedroom corner. But it won’t fit in my RV. Now that I look at them, most of the things are small enough to ship if I need to. I’m hoping it will be easy and go fast, and I plan to add more items every night. (That’s going to get old...) I’m anxious to see how I will do. It’s Monday, and back to work. It’s Monday, and back to work. I like Mondays, they are usually busy and before I know it, I’m ready to go home. I work from 7:00 am to 3:30 pm, so I miss our heavy San Diego traffic both ways and have a light commute. When I find the RV I want to buy, I’m thinking about leasing the condo and moving into the RV and living in an RV park for a while. There are some in the area where I could stay for six months, leave for two weeks, and move back, or move to another park for six months, etc. That would give me a start in fulltiming while continuing to work and getting paid every two weeks. If I can keep the condo rented, my mortgage will pretty much be paid by my tenant each month. I was talking to a friend last night, and she mentioned keeping a closet in the condo locked when it’s rented so I can store some of my stuff, and I realized I have a pretty good sized storage room in my carport area where my washer and dryer are, as well as my bike, golf clubs, boxes, etc. It’s separate from the condo, a good sized, secure space, and it locks. I could keep it for my private use, it’s not attached to the condo, my accessing it would not affect my tenant, and I’d have a “storage unit” for FREE. That solves one of my issues – I didn’t want to get rid of everything, but didn’t want to pay storage costs, or ask anyone to keep boxes, etc. for me while I’m on the road. It would be off limits for my tenant (I won’t even mention the washer and dryer), I would keep it locked and could store quite a bit of stuff there, for FREE! My only worry staying at an RV park while working is keeping Katie in the RV all day. When I first “rescued” her, I had a problem with her barking during the day, she’s very aware of noises outside and always barks. It was suggested I keep her in an inside bathroom during the day. That’s what I did, added a dog bed, with a gate in the door jam, and that worked. According to the dog trainer, she only feels responsible for that area, and she doesn’t bark anymore when I’m gone. I’m planning on a smaller Class C, though, and it won’t have separate spaces where I can leave her behind a closed door. How do fulltimers leave their dogs in their rig without the dog barking when they are left alone? As long as I can remember I've been thinking about getting a motor home when I retire, but it was only this year that I found out people actually LIVE in their motor homes. On Mother's day I visited my daughter and son-in-law and grandchildren, and they had just purchased a pop-up trailer to take camping and were awaiting delivery. We went to a few RV dealerships and looked at some rigs, and I was sold. Figuratively speaking. From that day on, I've been using most of my free time researching what was available, reading tons of blogs and forums, and creating file after file of "cut and paste" info. Really exciting stuff. That was May 9, and it's now August 8 - three months. 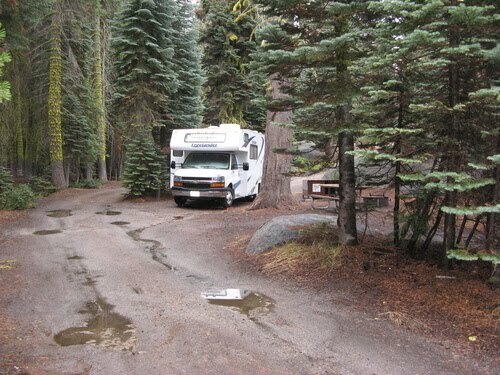 It was through reading the RVing blogs and forums that I discovered fulltiming and realized how perfect it would be for me when I retire in a couple of years. Emotionally, physically, mentally, spiritually, socially and financially it fits who I am. I’ve always thought I was “different” from most people because I love to move. Every two or three years, I’d sell my house, quit my job, and move. Buy another house, get another job and settle in for a few more years. I’ve always lived in California. I was born and raised in the San Francisco Bay Area, and as an adult I’ve lived in the San Jose area in multiple places, then to the Western slope of the Sierras in a couple of houses, next the Sacramento area, then the Central Valley, San Diego, back to the Sierras, and now in the San Diego area again. I’ve lived in 20 places since I left home be on my own at 19. I want to live in the mountains, at the beach, in the city... wherever I am, after a while I want to be in a different environment. Now I know – I have Gypsy blood. Like lots of other people, I just didn’t know any of them. Everyone I know, family and friends, are more “growing roots” kind of people. As an adult, I’ve live in more houses than my parents, brother and sister combined. Living in a house on wheels is perfect for someone like me. Unfortunately, this time I can’t move because of the housing market. I can’t sell until my house is at least worth my mortgage. I won’t get the 20%+ back that I put down, but if I can at least walk away with the mortgage paid off, I’ll do it. I’m hoping to have enough saved, and with my Social Security that will start in five months, will do fine fulltiming. My needs are few. If that doesn't work, I'll rent out my condo until it appreciates enough. Starting this year, instead of receiving a raise I’m working full time four days a week, with Fridays and weekends off. I'm loving that! I still do the same work, but in four days instead of five and it’s working for me and my employer. My main goal right now is to save as much money as I can, pay down my debts as soon as possible, and choose which RV I want. In January I'll start collecting Social Security, and that will be applied to credit cards until they are gone. Today I went through the house and boxed up items I’ve purchased from Costco and not used, and returned them, to the tune of $700! I felt so good about that. I have started getting together some things I don’t use, don’t need, don’t want – it’s amazing what you find when you go through closets and cupboards and drawers. I don’t use most of what I have, and my needs are so much simpler in my 60’s than they were when I was younger. So, Craigs List and E-Bay, here I come! I’m putting everything I make from the sales on credit cards or in savings. I’ve followed a few different people/couples who started their blogs at the beginning, before they purchased their RV and sold their house. I SO felt for them, the stress, uncertainty, and hard work that went with downsizing to this extent, and completely changing their lifestyles. Now they are all on the road, enjoying their fulltiming lifestyles and not looking back. I knew the same thing was in my future, and it helped to have a blueprint of sorts. I’m sure there are lots of people right now, right where I am, just at the beginning. So… it is finally starting. I am hoping to be on the road, or very close to it, in the Spring of 2012.